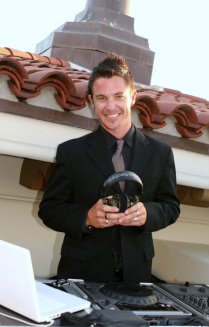 DJ Spencer is Santa Barbara's top radio personality, having DJ'ed at radio stations KJEE 92.9FM, STAR 98.7FM, KHTY 97.5FM, the legendary KROQ and is the current host of the morning show at 103.3 the VIBE. DJ Spencer holds regular nights at Indochine, the Velvet Jones and Tonic. His is the ultimate host - his wit, humor and professionalism would rival any host on radio or television today. Spencer's larger-than-life, natural rock star persona and highly honed musical taste make him a perfect fit for any event. DJ Spencer has hosted and DJ'ed weddings, corporate parties, school functions, major arena events, and an impressive array of special events. If you are looking for the perfect host, your search ends here. Oh, and Spencer is a licensed Officiant, if you wanted him to marry you ;) Here's Spencer in action (officiant videos below).